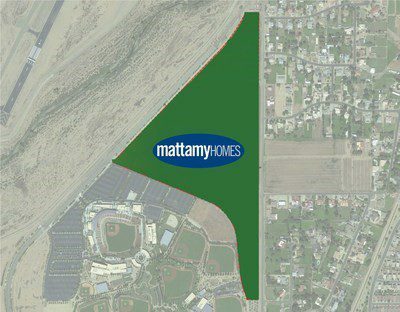 PHOENIX, AZ – Mattamy Homes is pleased to announce that it has acquired a significant property in Phoenix, AZ, located next to Camelback Ranch-Glendale Field, the home of spring training and year-round player development for the LA Dodgers and Chicago White Sox. This purchase will enable Mattamy to bring new homes and the company’s unique community design into an area that has been otherwise developed for many years. The acquisition is for a 59-acre piece of property, zoned for 199 lots in total. Mattamy purchased the property from Mortgages Limited for $6.3 million, with the deal having closed on Dec. 21, 2018. Mattamy will be building single-family homes on the site (a combination of 45′-, 55′- and 154′-foot wide lots) including popular floorplans from its Peoria-WestWing Mountain and upcoming Goodyear-Canyon Trails communities. The still-to-be-named Mattamy community at Camelback Ranch-Glendale is expected to open for sale in December 2019 with first closings of homes also happening in December 2019. Land development will start immediately. The Mattamy community will be gated with private streets and feature an abundance of open space, nearly 30% of the total property. The location will offer great access to Loop 101 and Interstate 10, and is close to major area employment as well as easy commuting to other areas of the valley, including downtown. Additionally, Ball Park Boulevard will be extended north to Maryland Avenue and then east to the Loop 101 to tie into the existing Maryland Road. This will give future Mattamy Homes residents as well as existing homeowners in the area excellent access to the amenities of the Westgate Entertainment District, including State Farm Stadium, home of the Arizona Cardinals, and Gila River Arena, home of the Arizona Coyotes, which also offer major events and concerts throughout the year. Mattamy Homes is the largest privately owned homebuilder in North America, with a 40-year history of operations across the United States and Canada. Every year, Mattamy helps more than 7,000 families realize their dream of home ownership. In the United States, the company is represented in 10 markets – Charlotte, Raleigh, Phoenix, Tucson, Jacksonville, Orlando (where its US head office is located), Tampa, Sarasota, Naples and Southeast Florida – and in Canada, its communities stretch across the Greater Toronto Area, as well as in Ottawa, Calgary and Edmonton. Visit www.mattamyhomes.com for more information.